Similarly, to yesterday’s explanation of the POLL of POLLS (PoPs), we will use some fictive polls to illustrate the trend analysis. Yesterday’s articles explained the PoPs. For the trend analysis, we need to receive a few more polls from the same statistics companies or pollsters, spread out over a longer period of time, for the same district. As you can see, the two polls have two different sets of numbers. Yet, in a trend analysis, voting percentage matter less than TREND! Ie how much this voting percentage changed over time. 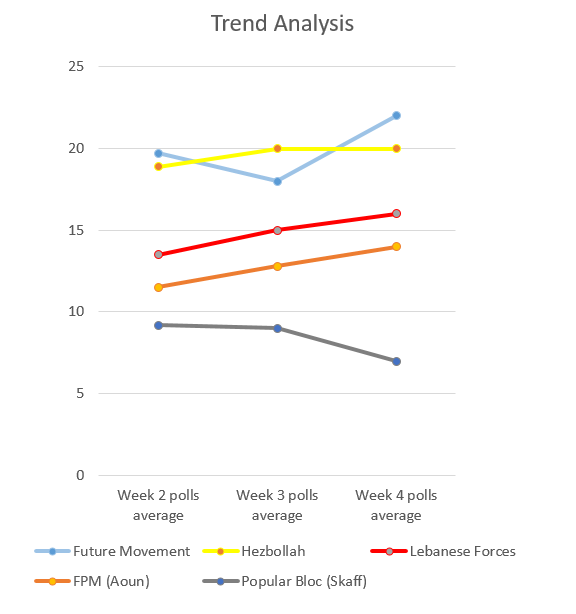 For convenience sake, let’s assume another set of polls came out after another week (we will call it week 3), and we calculated the average and we got these results. In conclusion, if we use both tools PoPs and the Trend Analysis we can obtain a much clearer picture of the electoral race than using any other poll or numbers! This website will focus on these two tools and we will try to update our main trend analysis and PoPs charts, as often as the abundance of polls allows us.